Fortunately our stomach problems had cleared up before we departed for Obergurgl in Austria. Despite poor snow over Christmas over most of the Alps, the resort had received a huge dump in the previous week which was still drifting down as we arrived on Saturday evening. We stayed at the Hotel Madeleine, which is a short, slippery walk to the bus station at the southern end of the village. The food and service were outstanding. We skied with another couple for most of the week. At dinner, Stewart and Chris would recall their experiences with the hotel's 'non-textile' sauna and jacuzzi etiquette. The snow was superb with temperatures in the minus single figures during the week. While Mrs M enjoyed such delights as Goulash soup and hot chocolate for lunch, I munched a mountain of chips with a mug of Glühwein every single day. There is no finer smell than an Austrian mountain-top restaurant and my appetite was slowly returning. 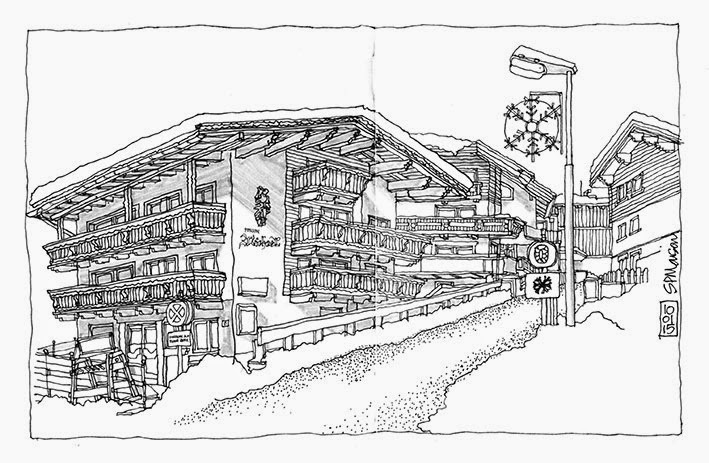 After skiing, Mrs M would return to the hotel for a hot bath while I sat in a sheltered spot to sketch a typical Austrian hotel. The problem with sketching in this sort of environment is that cold tends to creep up on you until the point when you realise that involuntary shivering has commenced, forcing a hasty, teeth-juddering return to base camp. After the first occasion, common sense limited scribbling to bouts of 30 to 40 minutes at most. The wind picked up on the last day of skiing which closed Hochgurgl and most of the runs in Obergurgl. As the light was also extremely poor, we decided to call it a day at 2.30 pm. On the morning of our departure, there was no skiing anywhere as high winds and rain had closed the resort. We walked to David's Hut with Stewart and Chris and witnessed an avalanche on the non-resort side of the valley. 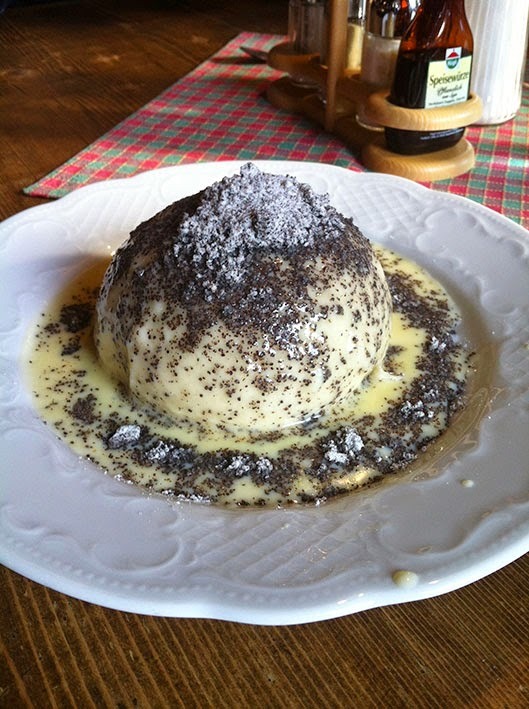 With my appetite back to normal, I was in the mood for a Germknödel with vanilla sauce and a huge pile of poppy seeds. Yum. With a few more hours to kill before our buses to Innsbruck, we took lunch in the hotel's pizza restaurant. Having not eaten a pizza for at least eight years, I may have over-achieved. A couple of hours later, I was bidding farewell to Stewart and Chris as the bus drove off without me forcing Mrs M to squeal at the driver. We met them again in the departure lounge before we headed back to Gatwick. Nice to read your accounts of your week in obergurgle. I hope you and Mrs Ms knees have recoverd from your skiing holiday. Chris and I had a fantastic holiday and it was great to meet you and Sarah. Nice to see the weather is good in Singapore, it still seems quite unsettled in Austria. P.s love the picture you drew. We had a great time thanks to your fine company as well! The snow conditions look perfect now according to the Obergurgl snow report. Knees are almost recovered, but might need servicing before the next holiday. I trust Stewart’s poorly has healed? We’re now firmly settled back into the exciting Singapore lifestyle(? ), although Mrs M is going back to our house in a couple of weeks. At least there’s plenty of sketching to be done over Chinese New Year. If you’re ever in Singapore, you know where we are.